Extraordinary looking hair calls for extraordinary products like the amazing All Soft Hair Care Line I received for this review and giveaway from Redken 5th Avenue. This is a set of five remarkable products that can reverse dry, brittle hair and turn it into healthy, soft hair that will make you the envy of all your friends from how it will shine and bounce with new vitality and luster. Why this All Soft Line is so unique is due to their revolutionary new delivery system, the Interlock Protein Network, and the Keratin Enrich Complex that use argan oil to restore protein back to the hair at the cortex for deep penetration while moisturizing to new extremes. 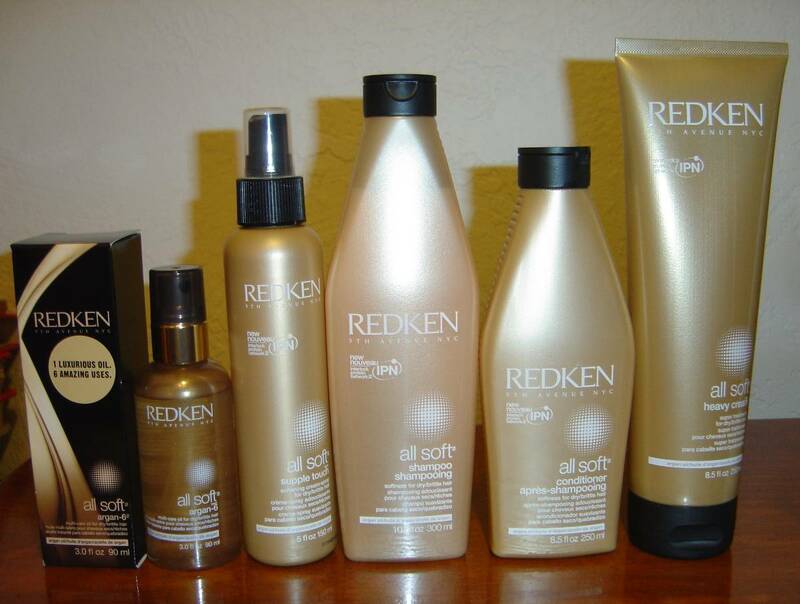 Redken All Soft Shampoo is what I tried first. This is a rich nourishing formula with a fabulous fragrance that lathered up wonderfully and rinsed out easily. Next, I sampled the Redken All Soft Conditioner to follow that product. This was wonderful to detangle hair that is prone to knots like mine. After working it into a lather, I rinsed it out after about a minute or two. Before I finished and headed for my blow dryer, I applied some of the All Soft Argan-6 Oil. This multi-use product is a miracle worker for damaged hair as I told you before. You can use it as heat shield before reaching for your blow dryer, as a deep conditioner to leave on your hair overnight, smooth out misbehaving hair with a drop or two when blow-drying, to give yourself a treatment before washing for an extra hair help, or even as a shine booster. I applied a few drops of the All Soft Argan-6 Oil to my towel-dried hair and left it in. Afterwards, I applied heat with my blow-dryer and curling iron. My hair does suffer from dryness. However, I am glad to report it was back to its glorious old self within one treatment. Later in that week, I added the All Soft Heavy Cream after washing with the All Soft Shampoo. This is a heavier duty softening mask that I left in for about fifteen minutes (the maximum time) for some extra deep conditioning. Well, I didn’t think my hair could look or feel more luxurious, but it was even more beautiful than before once I finished drying and styling. I eventually wanted to see how the All Soft Supple Touch Softening Cream-Spray worked so I experimented with that product. This one I used after using the regular All Soft Shampoo and Conditioner and applied some to the mid-lengths and ends of my towel-dried hair. I did not rinse this out but dried and styled with my curling iron. By now, my hair was looking incredible. I did not think it could possibly look too much better until I discovered how utterly gorgeous hair was now on my head without being weighed down while making it easier to manage. This line is simply one of the best for repairing that dry, brittle feel and delivering unbelievable movie-star quality hair! No wonder the All Soft Line has received so many awards for excellence. Honestly, I highly recommend these products because they do perform for that dramatic difference! Thanks to Redken 5th Avenue, one lucky Nuts 4 Stuff reader in the United States wins the entire five product All Soft Hair Care Line ($88.50 value) to help restore that softness and health back to your hair so you can look perfect for your big Valentine’s Day Date! 2. Go to Redken 5th Avenue and tell me which product you would love to try also or something you learned from the site in another comment. This giveaway ends February 3, 2012 at 12 PM Eastern Standard Time. The winner will need to respond to my email with name and shipping address within 48-hours or another winner will be picked. Previous Post How to Unravel That Knot in Your Necklace With Ease! I'd also love to try the Clear Moisture Shampoo. Extreme Anti-Snapleave in conditioner is a must for my hair — Provides heat protection, reduces friction from brushing and helps prevent breakage and split ends.It would be great to have. I would like to try the Color Extend Shampoo. I follow on GFC (Tamra). Email is in my blogger profile. Thanks!! fresh curls productstruwinner@gmail.comI so need a new product that works with my curls..everytime I find one they stop making it. I'd like to try the refining sea polish. 1 I like Nuts 4 Stuff on facebook. 2 I like Nuts 4 Stuff on facebook. I visited and I would also like to try the Gold Glimmer Perfecting Shine. I would like to try Curl Wise 14.
i like redken on facebook and my facebook is jodi frasier. Like Nuts 4 Stuff on Facebook. Subscribed to Nuts 4 Stuff via email. I would love to try the ALL SOFT ARGAN-6 OIL! I'd love to try the refreshing detox shampoo! The Gold Glimmer perfecting shine treatment sounds perfect for me! Thanks! I'd love to try the Color Extend Rich Recovery conditioner. I would like to try the forceful 23 super strength finishing spray. I can never find a hairspray that works more than a few hours for me.TYVM~! I would like to try hot sets 22 thermal setting mist to use with my iron. Love Redken products!! Great contest! I would like to try the crystal curls 06 defining shine gel. Radiant Sea Spray, anything beachy is good. Following Nuts4Stuff on Twitter as @kcthelushII. I would love to try the All Soft Argan-6 Oil. I'd like to try something from their clear moisture line. I am a GFC follower: Reejen.After visiting Redken's site I would love to try the STRUCTURE WAX. The classic styling wax delivers bold hold with a shiny finish and maximum staying power. I follow you with GFC as MountainMommy. Thanks! I learned that Redken has a whole line of products for men. My husband is still a lover of 2-N-1 shampoos and I was shocked to see that they made one for men! I will definitely keep that in mind for next Christmas. Refining Sea PolishGentle exfoliant, enriched with pumice, removes impurities and refines the hair's surface leaving it smooth and shiny. Thanks for the contest.